Flooring 101: Should You Reapply Your Own Finish Or Hire Someone? Flooring 101: How do I care for laminate floors? Flooring 101: Do I need to be home for installation? Flooring 101: What is the best flooring for high traffic areas? Flooring 101: Do I need to oil my hardwood floors? Flooring 101: Can I install it myself or do I need multiple people? Flooring 101: Will climate affect my floor? Flooring 101: Which rooms are best for hardwood flooring? Flooring 101: Should I hire a contractor to install my flooring or do it myself? Flooring 101: How do I protect my new floor from being damaged by the sun? The following elements of this website are the property of Simi Flooring or our suppliers, and are protected by United States and international copyright laws: All text, graphics, logos, button icons, images, audio clips, digital downloads, and data compilations -- both individually and as they are compiled on the site. The layout, functionality and software of this website are the property of TRIXMEDIA and/or Goozga, and are protected by United States and international copyright laws. The trademarks or trade dress of Simi Flooring and our affiliates may not be used without our written permission. Trademarks or trade dress include the Simi Flooring name and logo, and other graphics, logos, page headers, button icons, scripts, and service names of Simi Flooring products, services, and programs, and those of our affiliates. All other trademarks that appear on this site are the property of their respective owners, including Goozga by TRIXMEDIA, who may or may not be affiliated with, connected to, or sponsored by us or our affiliates. One or more patents may apply to this website. These patents may be owned by Simi Flooring or TRIXMEDIA, provider of ecommerce and shopping cart platform Goozga. You have permission to electronically copy and print hard copies of pages from this website solely for personal, non-commercial purposes related to placing an order or shopping with SimiFlooring.com. Unless we give you written permission in advance, any other use of this website, its content and its information, including linking or framing to this website, is strictly prohibited. Our goal is to provide complete, accurate, up-to-date information on our website. Unfortunately, it is not possible to ensure that any website is completely free of human or technological errors. This site may contain typographical mistakes, inaccuracies, or omissions, some of which may relate to pricing and availability, and some information may not be complete or current. We reserve the right to correct any errors, inaccuracies or omissions -- including after an order has been submitted -- and to change or update information at any time without prior notice. We sincerely apologize for any inconvenience this may cause. Except for information necessary to place an order, we do not want to receive confidential or proprietary information or trade secrets through this website. Any information, materials, suggestions, ideas or comments sent to us will be deemed non-confidential, and by submitting it, you are granting us an irrevocable and unrestricted license to use, modify, reproduce, transmit, display and distribute it for any purpose whatsoever, with no payment or other compensation to you. However, we will not use your name unless we are required by law to identify the source of the materials, information, suggestions, ideas or comments, or unless we first obtain your permission. 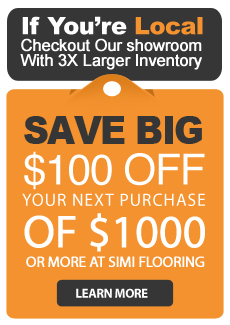 As part of our ongoing commitment to ensure that your shopping experience with SimiFlooring.com is protected, Simi Flooring will prosecute all unauthorized or fraudulent transactions to the fullest extent allowed by law.